This is always a challenging question for businesses seeking certification. How much documentation is the right amount to ensure your quality management system can reliably deliver a quality product or service? Some say that a well run business can achieve quality and efficiency with only the mandatory processes documented. Others say they have seen this attempted but not done successfully. Others say "it all depends". 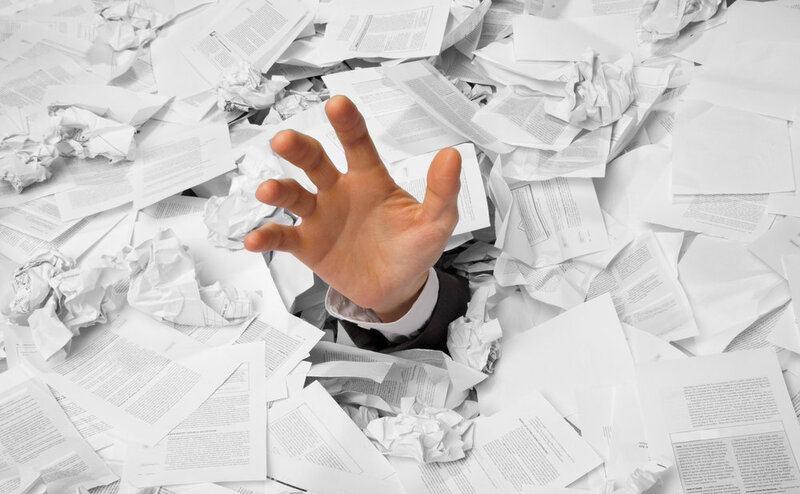 We know that too much documentation can slow the business down, restrict change and improvement, and can become a costly administrative burden. Early on in the emergence of quality management, the extent of documentation was seen as evidence of a well considered and defined quality system. More documentation meant there had been more thought put into defining and detailing processes and that meant greater control over quality processes in the business. There are many examples of quality manuals and supporting documents that seemed to go on endlessly. One example I have seen is where the internal audit process was documented, then the checklist of areas to be audited was documents - so far so good. But then there were procedures written on how the process should be reviewed in the audit, such as what to look for and what questions to ask, and on what constituted a non-conformance, and how much detail needed to be written in to the report, and a procedure for how the non-conformance should be addressed and when it would be considered closed out. This sort of documentation ran to many pages. Probably the first and last time it was read was when it was drafted, so it wasn't much use to anyone anyway. The other problem was that it would be almost impossible to update - if (when) the underlying operational process changed then the checklist would change, the definition of a non-conformance against the new process would change, the amount of detail needed in the report might change... and so on and so on. A documented management system in this much detail often became its own worst enemy. It would end up being so difficult to change anything that the business would not make any changes. That doesn't sit well with the ultimate quality objective of continuous improvement! Most quality managers and auditors today agree that too much documentation does not support an effective quality management system. It is still open to interpretation on how much is appropriate. The minimum level of documentation is the mandatory documents, identified in the AS/NZS ISO 9001:2008 standard with the words "documented statement of", and "establish a documented procedure to". There are three mandatory statements - the quality policy and quality objectives (4.2.1) and the scope and process outline in the quality manual (4.2.1). There are six mandatory procedures - control of documents (4.2.3), control of records (4.2.4), internal audit (8.2.2), control of non-conforming product (8.3), corrective actions (8.5.2) and preventive action (8.5.3). Section 4.2.1 also requires that processes be established to ensure the effective planning, operation and control of processes. But it doesn't say these processes need to be documented. So you could have an effective quality management system with only the mandatory statements and mandatory procedures that are documented. But that might make it a bit difficult to ensure the quality management system is effective, and is a system. There are a number of factors which can influence the amount of documentation needed for an effective quality system. The first would be the type of processes. Processes which are complex, perhaps those which are newly designed or rely on new technology, or produced across multiple work sites or work groups, might all be more effective and better understood by staff if they were documented. Products and services which are high risk - in their production, environment, in their delivery or application, might all be more reliably adhered to is the processes are documented. If there is a high level of change in the business or the processes, or perhaps a high level of staff turnover, then procedures might be better documented. On the other hand, if staff are highly trained, are experienced and competent then detailed documentation may not be so important. One way I approach this question is to consider the major risks and the major differentiators in the process. I call this the "black hat" and the "white hat" (with thanks to Edward de Bono). The "Black hat" elements of a process are the high risk areas with major consequences. These are the areas that you cannot afford to not do properly. If these parts of the process are not followed properly perhaps someone gets hurt, or the product/service will fail, or the process will not comply with statutory requirements etc. These steps should be documented so everyone is clear on what should be done, when and how, and where necessary, proper records made. The "white hat" elements of the process are the parts that differentiate your product/service from others, and make it recognisable and valued by your clients. You can't afford to not do this right, either, so document the steps so they are very clear. Another approach I would take is to consider the best way to present the documentation. Procedures are often written in flowing text using sentences and numbered paragraphs. But there are other ways to define and document a procedure - you can use a flow chart (great for the "right brainers" amongst us), you can use a checklist on which you mark each step as it is completed. Workflow control systems can be used to the same effect. Some suggest you can use training materials (although usually these are drafted as background references and information rather than a statement of steps that must be followed). In the end, you must be confident that the approach you select and the amount of detail you chose to document is appropriate and will assist in the effective planning, operation and control of processes. Very often this is a matter of trial and error. Don't be afraid to set it out as best you can, then refine, modify, simplify and improve as you and the business learn how best to make this work for you.